I can’t claim to be a blues aficionado, but everyone knows B.B. King is one of the greatest blues guitarists and singers of all time. With all the outpouring of love on social media on Friday at the news of his passing, it’s clear that a big hole is left in the hearts of those who loved B.B., his performances, his connection to his famous guitar, “Lucille,” and his catalog of hits. Here is the poem I put together on Facebook from my friends’ Status Updates that day, and following, King’s hit, The Thrill Is Gone, because clearly, with his passing, it is. And, as an added bonus, I’m including a song of B.B.’s that was my friend, and real estate broker/owner extraordinaire, Nelson Taylor’s favorite. Hi, there, my sweet white sister who you are For Always so, so very much, Wendy Jane! Sister, I just so love this dear and wonderful tribute to our late B.B. King! This is just marvelous and so full of Spirit and soul, and just spectacular, my friend! Wendy Jane, I love this! 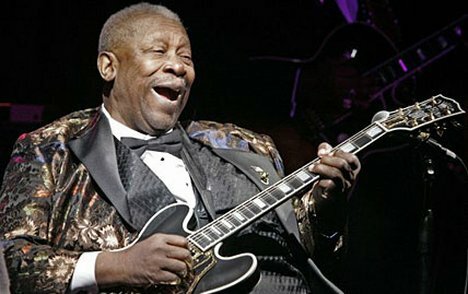 I just so enjoyed seeing the sheer joy on his face as he so gracefully sang and played his beautiful music with his elegant and sharp Lucille, and the love on his face as I could tell just how much he loved and cherished his music in playing on Lucille and singing his very heart out! I loved the other performers and their instrumentation, and all in all this was such a cool and a grand performance which touched my and moved me in my very Spirit, sister! Thank-you so for this great musical contribution which has greatly added to my now even more superbly super Sunday, and made me feel even more relaxed, cool, and serene! What a joy and a blessings this musical contribution of yours is, sister, and your cool and uplifting in the Spirit and soul blog post article of yours, Wendy Jane!!!!!!! Sisterfriend, I have always enjoyed the fantabulous music and singing of our B.B. King! My now late mother and my now late maternal grandmother would very often play his fantastic music on their records back then! My mother would often say sarcastically about my father that the thrill was gone when she would play and quote from this great song-I remember her doing so and saying so a whole lot, sister! What a great talent our B. B. King was and he will for sure For Always be missed! Sister, I also so love the combined Facebook poem from all of you! This, too, is just the absolute best and the greatest and just says it all so well with such endearing and heartfelt meaning, sisterfriend!!!!!! Wendy Jane, you have gotten my Sunday just rolling with smooth serenity from your astounding blog post article and this magnificent musical contribution! Sister, please have a superbly super Sunday, and a wondrously wonderful week ahead, my friend!!!!! Thank-you so again my dearly special and precious white friend and sister for this great gift and a blessing! Hello, there, my dearly special and very precious white sisterfriend who you are For Always so, so very much, Wendy Jane! Sister, I just so love this grandly cool and so full of soul and Spirit revision of yours as well, my friend! I love Nelson Taylor’s choice as well, Sweet Little Angel! What a pleasantly cool and serenely comforting song this is, Wendy Jane! I love this!!!!!! I just so love seeing the sheer joy and love on our B.B. King’s face as he relishes in his cool and loving singing and also has so much enjoyment playing on his Lucille! What a joy this is to behold and in which to bear witness, sister! I, too, can so relate to Nelson as I rarely saw eye to eye with my parents and the rest of my family of origin and how I am, too, estranged from my family of origin! This really touched my heart reading about how Nelson no longer speaks to his father-I can for sure relate, sisterfriend! My sweet white sister, please have a totally terrific and thrilling Tuesday and a restful and relaxing rest of your week, my sweet friend! I thank-you so again for such spectacular and a moving and a touching blog post article with magnificent music that has greatly added to my day being absolutely thrilling, Wendy Jane!!!!!!! Thanks for going back and revisiting this revised post. I love your feelings you express of bearing witness to B.B. King relishing playing Lucille. I’m glad you could relate to Nelson’s touching words about he and his dad’s shared love of the blues and B.B.’s music, and the growing estrangement between them. Thanks for the good wishes, and I hope you have had a terrific Tuesday too, sisterfriend!